This cake has become a lifeline for me in the long stretches of time between breakfast and lunch and lunch and dinner in Spain. With 50% whole-wheat flour and no refined sugar, it is a slightly healthier take on the classic Spanish bizcocho, or teacake, made with olive oil, yogurt, orange juice and orange zest. The cake is luxuriously moist and packed with bright citrus flavor. With a cup of coffee and a square or two of dark chocolate, it has gotten me through many mornings and afternoons. 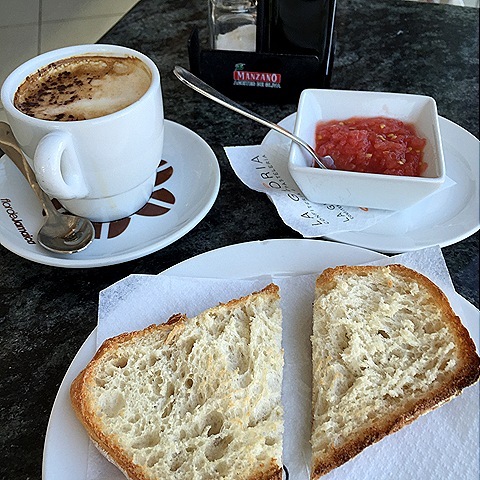 On the surface, I have adapted to the late lunch and dinner times in Spain. Unless we want to eat alone, we must adapt to the local rhythm, wherever we are. But I realize that I still see the Spanish mealtime hours with foreign eyes, particularly now that I have a child. Trying to feed my fussy two year old his “early” dinner at 8 pm, for instance, I daydreamed about my friends in the States who had their children in bed by this time, cutting the witching hour short. With such late meal times, snacks are vital, especially for children. The mid-morning almuerzo and the mid-afternoon merienda have to be substantial enough to sustain energy and keep melt downs (my son’s and my own) at bay. Rather than a lunch, I pack a snack for my son in his school bag, following guidelines from his teacher (see the chart below) that encourage variety and discourage too many convenience foods. (As in many industrialized countries, childhood obesity is on the rise in Spain, which is a whole other topic.) So it’s a sandwich on Monday, cookies or homemade bizcocho (quick bread or teacake) on Tuesdays, fruit on Wednesdays, cereals and grains on Thursdays and dairy on Fridays. This orange olive oil cake, which I pack along with nuts and dried fruit, has become one of my staples for my son’s Tuesday snack. It has also become one of my own snack-time staples. With an olive oil cake on the counter, the Spanish mealtime hours do not feel so foreign. I am at home. I make this cake in my Thermomix, the do-it-all kitchen appliance from German engineers, although you could, of course, also use a stand mixer, another type of food processor or mix the batter by hand. The recipe is adapted from a Spanish Thermomix recipe and calls for grinding the sugar into superfine crystals, which in theory makes the cake more tender. I haven’t yet tried making the cake without the grinding step, so can’t vouch for the results. I love the crisp edges the day the cake is made, but think the flavor is even better after a day, covered, on the counter. Preheat the oven to 350ºF and butter and flour a 9-inch round cake or springform pan. Grind the brown sugar into very fine crystals in a food processor. Add the orange zest and pulse several times to grind the zest and evenly distribute it throughout the sugar. Add the eggs to the sugar and mix on low speed until pale and frothy. Add the olive oil, yogurt and orange juice and mix until blended. Sift in the flours, baking powder, baking soda and salt and mix on low speed until just blended. Pour the batter into the greased pan and bake until the cake is golden and a toothpick inserted in the middle comes out clean, about 30 minutes. Allow the cake to cool in the pan for 10 minutes and then remove it to a cooling rack. Serve once the cake is completely cool. If you like, you can dust it with confectioners’ sugar for decoration. This cake keeps beautifully on the counter, covered, for several days. * Olive oil: Be sure to choose an olive oil whose flavor you enjoy, because you will taste it in the cake. If you cannot find a mild extra virgin olive oil, try “light” olive oil US, which has been refined and is not as pungent. * Baking powder: If you have access to Royal baking powder, you can use one 16-gram packet in place of the baking powder and baking soda. Stopping to look, I find traces of Murcia’s history everywhere—in crumbling bits of medieval wall around the city; in ruins beneath the cathedral; in my husband’s black hair and olive skin; in my son’s deep-as-midnight eyes; and, especially, in local foods like aletría. Aletría—saffron-seasoned pasta cooked in the same pan with short ribs, artichokes, tomatoes, red peppers and potatoes—reveals layers of the past just as an archaeological excavation would. The name aletría comes from an Arabic word for dried pasta, iṭriyah, and the dish is very similar to ittrilla, which appears in an anonymous thirteenth century cookbook from Al-Andalus. In the medieval version, noodles simmer in a broth made with fat-rich cuts of meat and seasonings like salt, pepper and coriander; before serving, the dish gets sprinkled with cinnamon and ginger. Today, the foundation is the same—you cook the noodles in a flavorful meat broth—but the dish has dropped most of the Moorish seasonings and taken on ingredients that reflect new rulers, like pork, and New World discoveries, like tomatoes. I found myself thinking about the layers of aletría on a recent visit to my favorite museum in Murcia, the Museo de Santa Clara, which provides another way to look at the city’s strata. The museum is part of a working convent, where a handful of elderly nuns continue to live in their cloistered community. Like many religious buildings in Murcia, the convent was constructed on top of Moorish remains, in this case a luxurious palace to different Arab rulers in the twelfth and thirteenth centuries. On the ground floor, devoted to Murcia’s Islamic past, I gazed upon remnants of the palace and reconstructions of intricate archways and a Moorish garden with a reflecting pool. Upstairs, I soaked in the history of the convent and its patron, Saint Clare of Assisi. As I looked at the layers, I could see all of the forces that had shaped the city, and dishes like aletría, more clearly. Here were the foundations of my son’s gaze and the basic building blocks of this stew that has nourished Murcia for generations. To make aletría, you follow the same basic techniques used in making paella – the pasta cooks in the pan with the vegetables and meat, soaking up flavor of the broth – but this dish is more forgiving, because it is easier to overcook rice than pasta. A similar dish minus the bell peppers, artichokes and potatoes, called fideos a la cazuela, is made in other parts of Spain. The final amount of water you need depends on many factors, such as the speed of the boil, the surface area of your pan and the exact amount of pasta you use. Add more hot water as needed to keep the ingredients just barely submerged. The final dish should be nearly dry rather than soupy. The cooking times are approximate, too. It may take more time, for instance, for the meat to become tender and the potatoes to cook. The first step is to sear all of the ingredients separately to concentrate the flavors. Heat 2 tbsp oil over medium-low heat in a heavy casserole or deep skillet. Add the red pepper strips and a pinch of salt. Cook the peppers, turning them frequently, until they have softened and are lightly brown on both sides, about 10 minutes. If the peppers brown too quickly before softening, lower the heat. Remove the peppers from the skillet and set aside. Raise the heat to medium, add another tablespoon of olive oil, the artichoke quarters and a pinch of salt. Sauté the artichokes until they are lightly browned on all sides and begin to soften, about five minutes. Remove the artichokes with a slotted spoon and set aside. Add another tablespoon of olive oil if necessary, the cubed potatoes and a pinch of salt and sauté until lightly golden on all sides. Remove and set aside. Generously season the ribs with salt and pepper. Once again, if there is not much olive oil left in the pan, add another tablespoon and increase the heat to medium-high. Sauté the ribs until they are nicely browned on all sides, turning frequently. The idea is not to cook the ribs, but to sear them and seal in the juice and flavor. Once the ribs are browned, reduce the heat to medium, stir in the minced garlic and cook for a minute or two until the garlic is fragrant. Add the grated tomato and cook, stirring frequently, until the tomato has lost much of its water, about five minutes. Cover the meat with water (about 2 cups/500 ml) and stir in the pinch of saffron and powdered yellow food coloring, if using. Bring to a boil and then reduce the heat until the water simmers steadily. Cook uncovered until the ribs are nearly tender, about 20 minutes, then add the artichokes and potatoes. Add more water to cover if needed and more salt to taste. Continue simmering until the potato is half-way cooked (about 10 to 15 minutes). Add another 2 cups/500 ml of water to the pan and bring to a boil. Stir in the pasta and red pepper and reduce the heat to a steady simmer. Taste the broth for salt, adding more as needed. Cook the pasta uncovered until it is al dente (about 11 minutes – follow the instructions on the package). Add more hot water as needed as you cook to keep the ingredients submerged. The final stew should not be soupy, but it should have a bit of broth. Remove the pan from the heat and let it sit for about 5 minutes before serving. Notes: In Spain, use No. 2 fideos, or break long, thin pasta such as spaghetti into one-inch (2.5-cm) lengths. My mother-in-law adds a handful of pasta per person plus an extra handful “for the pot”. Since saffron is a luxury ingredient, many home cooks in Spain rely on a sprinkling of powdered yellow food coloring to give dishes like paella and aletría a desirable sunny color that would take far too much of the exquisite spice to obtain. It wasn’t until I became a foreigner that learning to cook well became urgent. Part of this was selfish – I had no other choice but to cook when I could no longer buy my favorite granola, when there was no Cuban restaurant nearby to satisfy my ropa vieja cravings, when mediocre carrot cake wouldn’t do. These foods may sound trivial, but the familiar flavors provided direct comfort amidst my exciting yet often exhausting first months living in Avignon, France (a new job, new colleagues and friends, a bare-bones apartment that wasn’t yet home, maze-like streets to find my way through…). Yet as I cooked, I shared, and what began as a means for me to taste home evolved into a way to deepen connections with my new friends in Avignon from France, England, Italy, Germany, Spain and even Mongolia. We shared stories as we cooked and ate our favorite dishes from home together, foods that will always remind me of my now dear friends, like Irene’s gorgonzola gnocchi, Paqui’s ensaladilla rusa and Khosko’s buuz (Mongolian dumplings). If I am remembered for one food by my foreign friends, it may be “my” carrot cake. I love carrot cake, yet had never attempted to make one myself before I moved abroad in 2006 (first to France and then to Spain, where I have lived for seven years and counting). For ten years prior to the big leap, I lived in Portland, Oregon, where some of the best bakeries in the world turn out the carrot cake that haunts my dreams. Why would I need to make it at home? Yet in France, despite the equally craving-inducing (and memory-haunting) pastries, I longed to eat a satisfying slice of carrot cake. So I began experimenting with different recipes I found online (many thanks to the generous bloggers and magazine websites that share their content for free, you are lifesavers, and ambassadors, too, as you will see). Some cakes were too dry, some too chunky and distracting. My ideal carrot cake, I decided, has no nuts, raisins, pineapple or coconut, just sweet carrots and spice. After a handful of disappointing results, I finally found The One: Lisa Schoenfein’s carrot cake from the Saveur magazine online archives. What do I love about this cake? It is packed with carrots so is unfailingly moist, the spices are warming and enticing yet not overpowering, and, best of all, it lives up to my carrot cake dreams. I say best of all, although even better are the memories this carrot cake has given me. 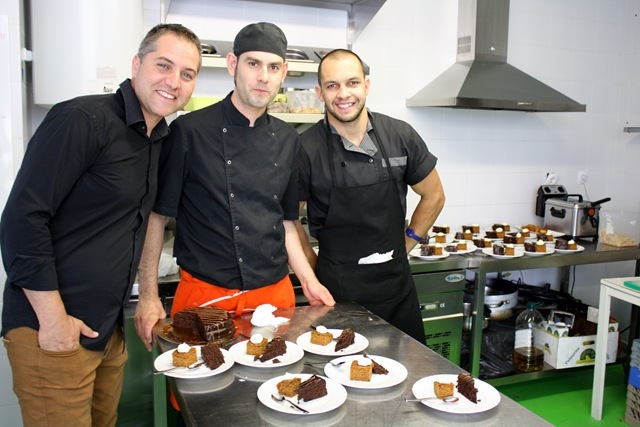 It is by far my most requested recipe here in Spain, and I have made it for countless parties, including my own wedding. Much more than a means to satisfy my own cravings, the cake has become a symbol of friendship across cultures. It starts conversations and makes people happy. This is what cooking well is all about. The most time-consuming part of making this otherwise easy cake is grating the 1½ pounds of carrots called for in the recipe, which is more than I have seen elsewhere. This amount ensures the cake is moist and naturally fragrant. I usually enlist my husband. The original frosting recipe calls for 3 cups of confectioners’ sugar, which I find way too sweet. I usually start with 1 cup and then add more by the tablespoon until I like the results. Between 1 and 1 ½ cups is enough for me. This recipe makes one 8” stacked, round cake. For parties, I double the recipe and make a single-layer sheet cake (no need to double the frosting quantities). Preheat your oven to 350 degrees F and butter and flour two 8-inch round cake pans (or one 11 x 15 inch sheet pan if doubling the recipe). Whisk together the flour, sugar, baking soda, baking powder, salt and spices in a large bowl. Add the oil and eggs and whisk or stir until you have a smooth batter. Using a rubber spatula, fold in the carrots until just blended. They will release their juices as you stir, easing the process. Divide the batter between the two cake pans. Bake until the surfaces of the cakes are deeply golden and a toothpick inserted into the center comes out clean, around 30-35 minutes (the original recipe calls for 25 minutes, although I have found this to be too short – with so many carrots in it, the cake has never dried out on me). Allow the cakes to cool on racks and then, in the case of the round cakes, remove from the pans. The sheet cake can be frosted directly in the pan once it has cooled completely. The original recipe says to use a high speed mixer to beat together the cream cheese, butter and vanilla extract until smooth and then to reduce the speed before adding the sugar. I have not always had a mixer, so have done this process both by hand and using a hand mixer. When mixed by hand, the frosting can be a bit lumpy, but still tastes great. I now use my Thermomix, which is akin to a super-powered blender, on a medium speed and get silky results. Too much speed can turn the frosting into liquid, which I discovered on the day of my wedding party. If you are making a stacked round cake, place one of the rounds on a large plate and top with about one-third of the frosting. Spread the frosting into an even layer. Top with the second cake round and finish icing with the remaining frosting. 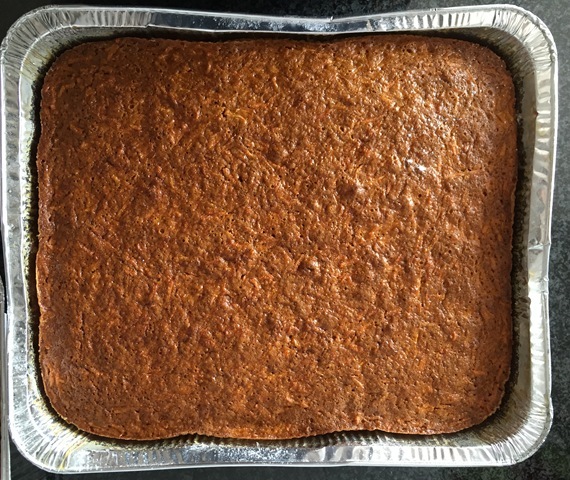 If you have doubled the recipe and are using a sheet pan, once the cake has cooled completely, spread the frosting across the top in a smooth, even layer. For fans of 17th century literature April 2016 is a seminal month, for it marks 400 years since the death of two literary giants: William Shakespeare and Miguel de Cervantes. Although it is commonly thought that both men died on the same day (April 23, 1616), Spain and England used different calendars at the time (Gregorian and Julian, respectively), so the two men’s deaths were actually 11 days apart. Still, the coincidence is striking. In honor of this anniversary, today’s post looks at a Spanish food idiom that was famously used by Cervantes in his classic work, Don Quixote. This 17th century novel, considered by many in the know to be one of the greatest works of fiction of all times, follows the tragicomic quest of a nobleman steeped in knightly romances to revive chivalry in what he sees as a depraved world. 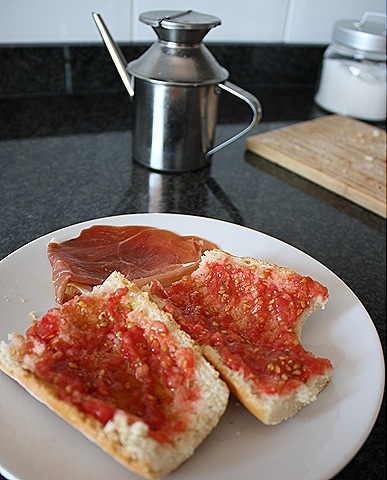 Click here for an introduction to the Spanish Food Idioms series. Why beans? And why habas (fava beans) in particular? 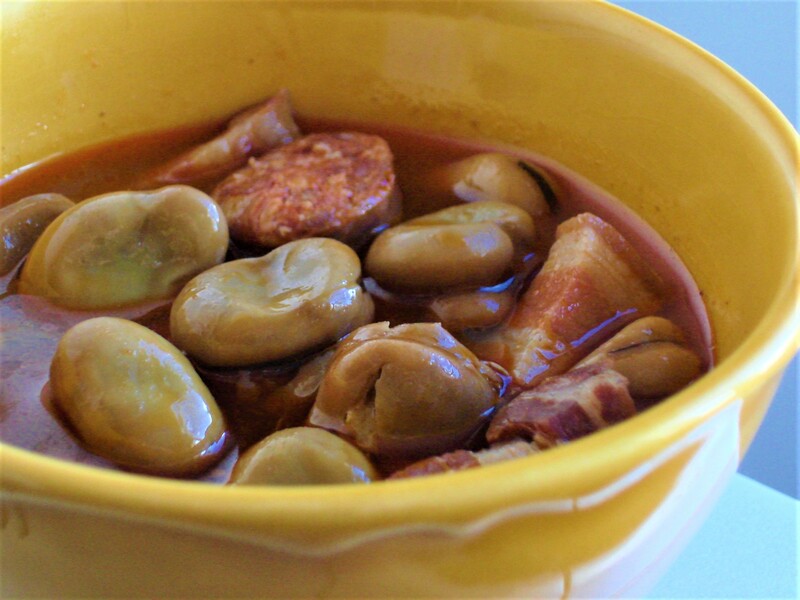 In the past, and certainly in Cervantes’ lifetime, fava beans and other such legumes were a major component of poor people’s diets in Spain because they were inexpensive and easy to find. The act of cooking beans like favas thus had negative connotations, representing hardship and the daily grind. *As translated by Edith Grossman in her contemporary English version of Don Quixote (Second Part, Chapter XIII, page 536). Today’s expression and similar variations are commonly used in the Spanish-speaking world, often by journalists and politicians in the context of corruption. Just look on Google. En todas partes cuecen habas = there is corruption everywhere. In the second part of the expression, “in my house they do it by the potful,” Panza is of course claiming that his house has more problems than the rest. Shakespeare, a master of universal truths, would certainly have found good use for today’s expression. Besides having died on nearly the same day and (purportedly) penned some of the most influential works of literature in history, Cervantes and Shakespeare share other commonalities. For example, due to gaps in their biographies, both men are infinite sources of debate and speculation. There are even theories that hold that Francis Bacon was the real author of both men’s works. Theories aside, the genius of Don Quixote and Shakespeare’s plays is undeniable. Such works are like an “open sesame” into the culture and language in which they were written. Just check out this list of 45 Everyday Phrases Coined by Shakespeare in the English language, and consider the Bard’s ongoing influence on popular culture. Can we survive without knowing such cultural references? Of course. But in my perspective, life is much richer when we can recognize these connections to the past. Shakespeare and Cervantes may be long gone, but we can rest assured that wherever we look there will always be a pot of beans on the fire. 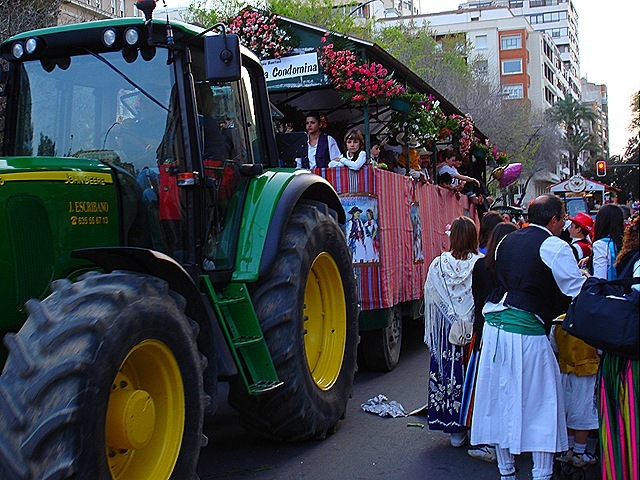 Like every Spanish city and town, Murcia has its own annual fiesta rooted in local traditions: the Bando de la Huerta. This day-long celebration pays homage to Murcia’s agrarian roots, its huerta, the cultivated lands within and surrounding the city once renowned as the huerta de Europa (the market garden of Europe). The Bando de la Huerta takes place every year on the Tuesday after Easter as part of the week-long Fiestas de Primavera, heralding spring’s arrival and offering a popular antidote to the (relatively) solemn activities of the Semana Santa, or Holy Week, before. 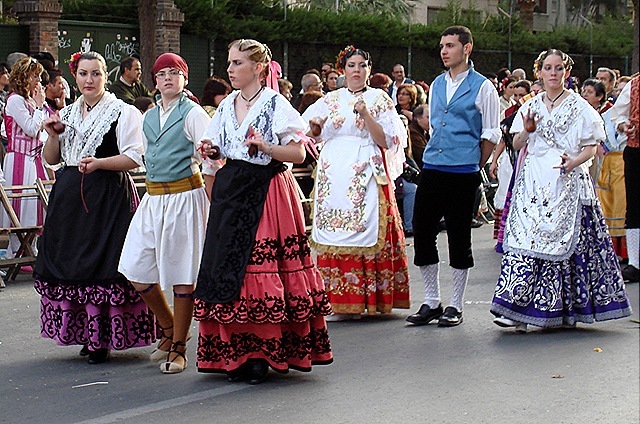 On the day of the festival, the people of Murcia descend upon the city center by the thousands, most dressed in traditional clothing. The men are known as huertanos and the women huertanas. 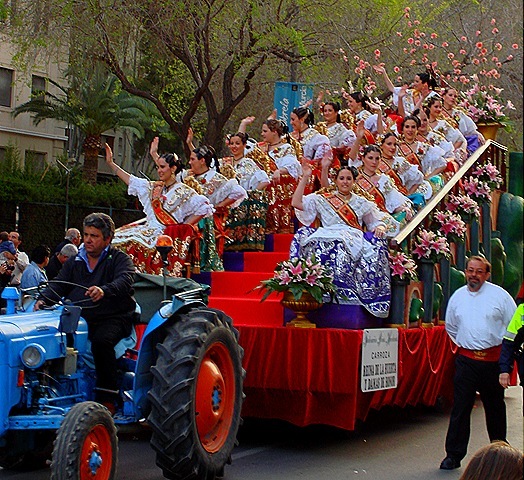 The centerpiece of the fiesta is a parade that brings Murcia’s past to life with period costumes and floats demonstrating time-honored huerta activities. 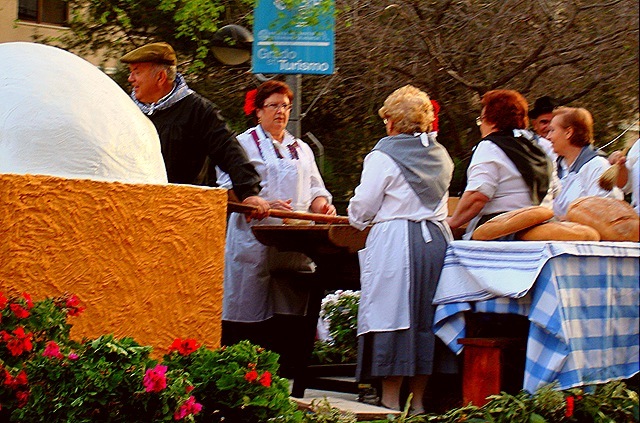 On one float, ladies knead and shape dough, which they place in a working, dome-shaped adobe oven to produce Murcia’s signature round loaves. On another float, young girls dance a jota in a bin of grapes, celebrating the local wine-making tradition. 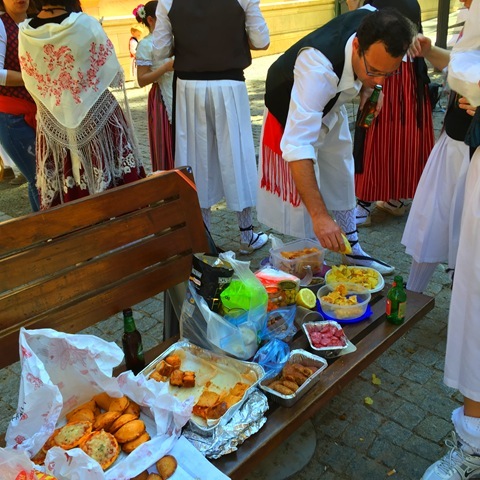 The most anticipated floats come at the end: tractor-drawn, open-air replicas of the typical homes of the huerta, barracas, complete with thatched roofs and loops of sausage hanging from the rafters. All along the parade route, riders toss out products from the huerta, like lemons, the aforementioned sausages and even small bottles of wine. 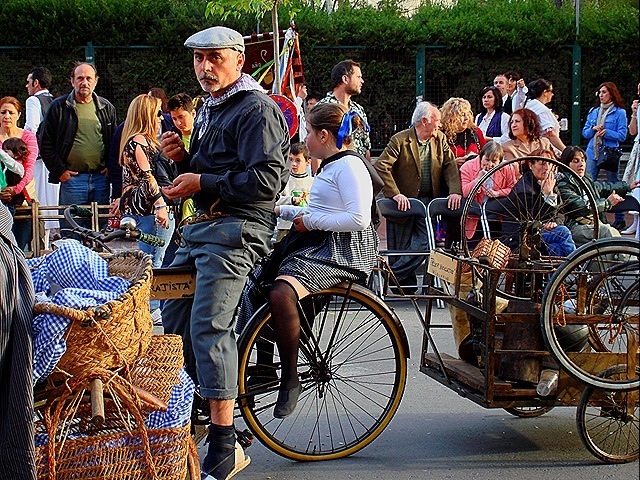 Sharing from the huerta is not only true of this annual parade, but remains a strong aspect of daily life in Murcia, where the idea of actually paying for local products like lemons is unthinkable to many locals. Despite the fact there isn’t nearly as much huerta as there used to be, the generous landscape that has fed families for centuries continues to give. This generosity is the heart of Murcia. Instead of fighting the crowds in packed restaurants, many locals opt to bring their own provisions to the party. Since the streets are closed off to traffic, any place is good for a picnic. We have set up shop with friends and family in the same spot for the last several years, so other friends know where to find us if they want to stop by for a beer and bite to eat. The sharing principal of the huerta extends to the partying, as well. Typical foods at our potluck-style picnic include general Spanish favorites like marinated olives and tortilla de patatas as well as snacks with a huertano twist like Murcian longaniza (sausages cured with pimentón), potato chips drizzled with fresh lemon juice, and savory pastries like the empanada murciana, packed with tuna, eggs and tomato. Even Mateo is in on the fun, enjoying the rare chance to drink Fanta. I usually bake American-style cookies for the picnic, which are much appreciated, but this year I decided to make an empanada murciana for the first time to share a taste of Murcia and its fiesta with family and friends on this blog. This nourishing savory pie pairs perfectly with ice-cold beer, and, an important consideration, keeps the effect of the beer in check. 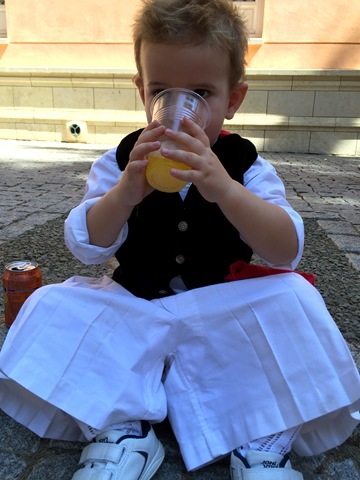 Spanish fiestas take stamina. If you, too, choose to make an empanada murciana, in the spirit of the city, be sure to invite your friends. Cheers! ¡Salud! In her cookbook The Food of Spain, Claudia Roden writes, “Empanadas, large savory pies, are a symbol of Galicia, while empanadillas, small turnovers, are a specialty of the Balearic Islands and Valencia.” To which I ask, “Hey, what about Murcia?” Both empanadas and empanadillas are specialties here, too! Murcia often gets left out like this. Yet the empanadas and empanadillas in Murcia are some of the best I have had anywhere, and they are among the foods I crave when I have been away for any length of time. 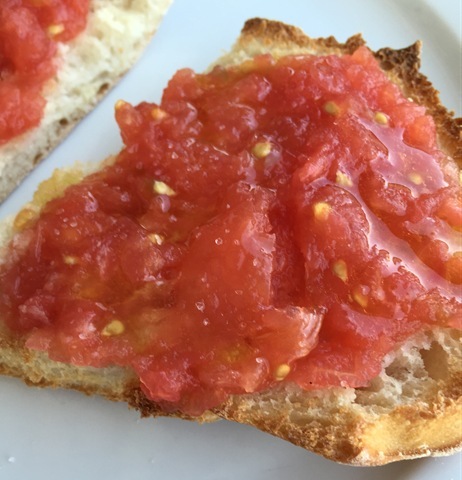 The main ingredient that sets the empanada murciana apart from similar pastries in Spain is the sweet pimentón in the dough, lending it a more intriguing flavor and a deep golden hue. 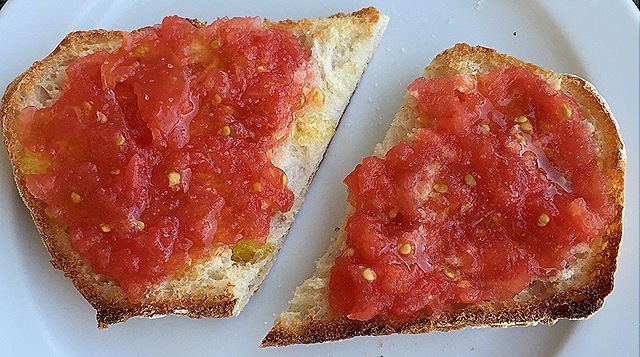 The traditional filling has just three simple ingredients that are pantry staples in Spain: eggs, olive oil-packed tuna and tomate frito, a sweet and jammy tomato sauce. These are the basic building blocks, yet every empanada murciana is slightly different, depending on the cook’s preferences. The dough can be made with or without a leavening agent, and the proportions and textures of each ingredient in the filling vary. Some like their tomato sauce chunky, while others like it smooth. In some cases, the sauce oozes out, and in others, there is just enough tomato to hold the other ingredients together. My favorite empanada murciana has flaky shortcrust pastry and a balanced blend of fillings. 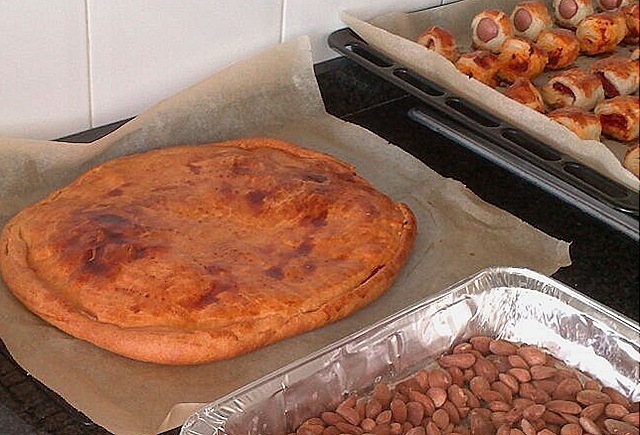 This is a recipe for the most basic, traditional version of the empanada murciana. Feel free to adapt the filling to your tastes. Some people add roasted red peppers and even peas to the mix, for example. I like to keep it simple. Make ahead: The tomate frito (recipe follows) and two hard-boiled eggs can be prepared up to several days in advance. The dough needs to rest for one hour before it can be rolled out. In Spain we can buy good canned tomate frito, which makes assembly quick and easy. My favorite brand is the Murcia-made Sandoval. I have not tried this recipe with jarred tomato sauces in the US. I have used canned whole tomatoes here because I like to control the size of the chunks, but you can also use diced or crushed tomatoes, as well. If you have good fresh tomatoes, by all means use them. You can make the tomate frito up to several days in advance and store it in the refrigerator. It also freezes well. Combine the olive oil, tomatoes and one tablespoon of sugar (plus 1 teaspoon of salt if using fresh tomatoes) in a deep saucepan (I use a Dutch oven – this sauce likes to spatter). Stir while you heat the sauce over medium heat until it bubbles. Leave the pan uncovered and reduce the heat to low to maintain a gentle simmer for 45-50 minutes, stirring occasionally so that the sauce does not stick and burn. If you have used canned whole tomatoes, break them up with the spoon as you go. The final sauce should be reduced, jammy and sweet. Add more sugar and salt to taste. Allow to cool and use immediately or store in the refrigerator for up to several days or in the freezer for up to several months. Makes about 1 1/2 cups. I use this amount for my empanada. Empanada dough is relatively easy to make, based on a simple ratio: equal parts olive oil and white wine, a bit of salt and pimentón, and as much flour as you need for the dough to come together (“lo que admita,” as my friend Inma says, “as much as it takes”). 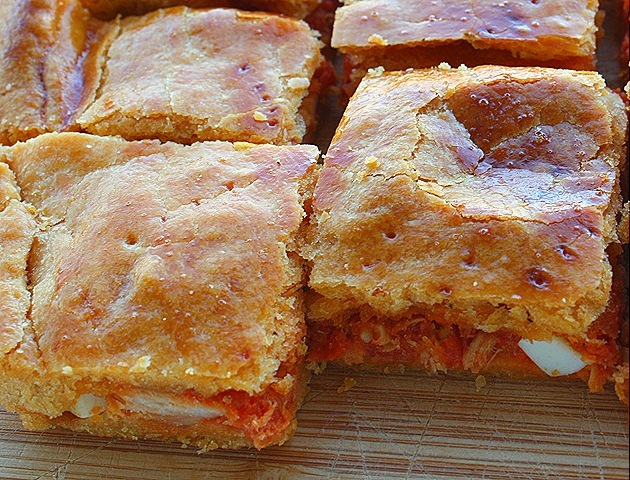 The empanada murciana has two traditional shapes: rectangular and circular. My first attempt turned out somewhere between a rectangle and an oval, which wasn’t noticeable once we cut it up. Nevertheless, the aesthetics need some work. You can also make empanadillas, small pies, with the same dough and filling, which will be tackled in another post. Whisk together the olive oil, wine, salt and pimentón together in a large bowl until the seasonings have dissolved. Add the 2 1/2 cups of flour and mix well with a wooden spoon or your hands, being careful not to overmix. The dough should hold together easily and be smooth to the touch. If it seems too sticky, add more flour as needed a tablespoon at a time. Allow the dough to rest at room temperature for at least one hour in a bowl covered with a clean dish towel or plastic wrap. There are different approaches to making the filling. You can either mix all the ingredients together in a bowl first or place each ingredient separately onto the dough. I take the first route for a more homogeneous texture, which is more to my two-year-old son’s liking. Big chunks of anything tend to get spit out. I break up the tuna, mix it with the tomate frito and then stir in small bits of egg. Line an 11- by 15-inch cake pan with parchment paper and preheat the oven to 350ºF. Divide the dough into two pieces, one slightly larger than the other, then roll out the larger piece of on a clean surface until it is 1/4 inch thick. The base should be nearly as large as your pan. You shouldn’t need to use flour as this is an oily dough that doesn’t tend to stick. 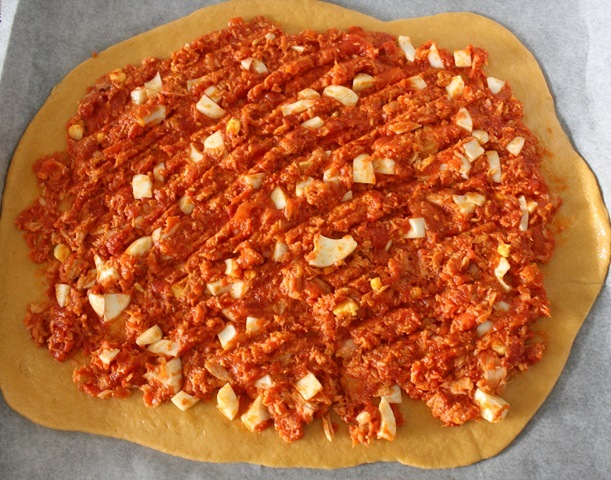 Carefully transfer the dough by rolling it up onto your rolling pin and then unrolling it into the parchment-lined pan. Alternately, you can roll out the dough directly on the parchment paper on the counter and then transfer both carefully to the pan. Cover the base with the filling, leaving about a one-inch border. Roll out the second portion of dough to the same thickness, so that it is big enough to cover the filling. Transfer the dough using your rolling pin as above and carefully unroll it over the base. Fold the bottom edges of the dough over the top and crimp together. Pierce the top of the dough in various places with a fork to allow steam to escape. Brush the surface of the dough with beaten egg, then bake for about 30 minutes until golden. Cut into squares before serving hot or at room temperature with an ice-cold lager.